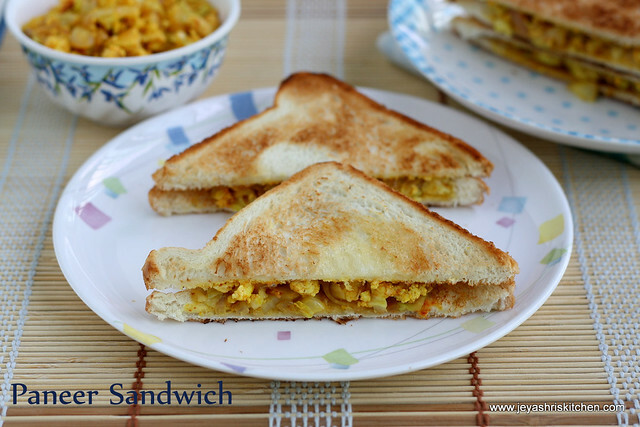 Paneer sandwich with cabbage, is a kids friendly snack or lunch box recipe. 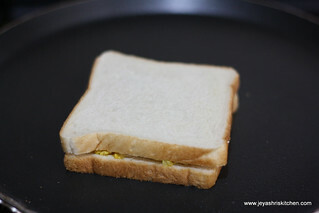 Few days back when was breaking my head as what to make for kids snacks , suddenly this idea of making panner sandwich came to my mind. 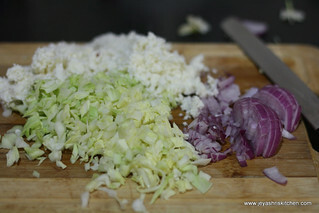 I added cabbage to the panner and my kids who hates cabbage never realised that i have added cabbage in the panner sandwich. Cabbage can be replaced with carrot too. 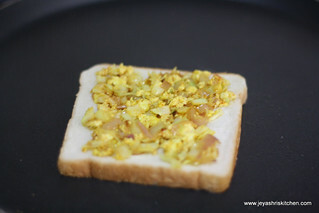 You can spread some green chutney on the sandwich to make it more tasty. 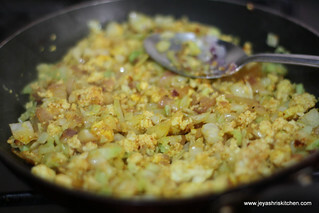 In a pan, add add and add the onions and when it turns pink add the scrambled paneer and the cabbage. 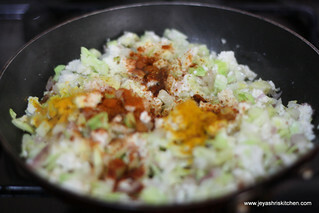 Now add coriander powder, red chilli powder and pav bhaji masala,salt and mix well. 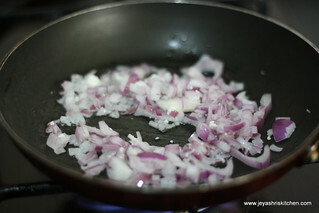 Cook for a minute and switch off the flame. 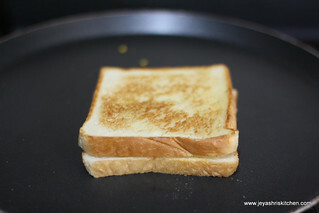 Place a bread slice in a griddle(tawa) . Apply butter on the side which you are placing down. Spread the filling on the top and place the other slice on the top. Carefully turn it upside down. Repeat the same procedure for rest of the bread slices. You can do the entire toasting in the sandwich maker too. Red chilli powder can be replaced with pepper powder. Grated carrots and boiled potatoes can be added to the filling. I used white bread, you can use whole meal bread too. If packing for kids box, spread little extra butter to avoid drying. If you want you can cut the edges of the bread too and without discarding the edges make the Italian bread Soup. Garam masala can also be used instead of pav bhaji masala. best way to make them eat veges..will make this for my son soon..
unique combination paneer and cabbage neverthless looks delicious jayashree! it s so tasty n healthy too...nice variation....thanks....very nice recipe. 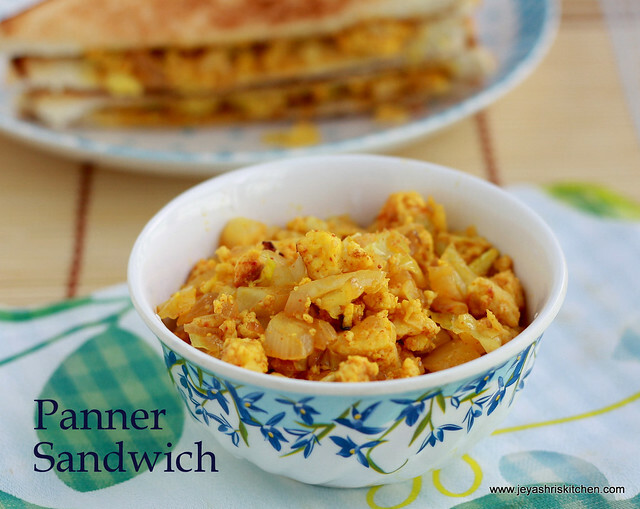 Easy to go recipe..nice idea to sneak cabbage along with panner..
Nice combo & delicious sandwich!! very filling and delicious sandwiches!!! 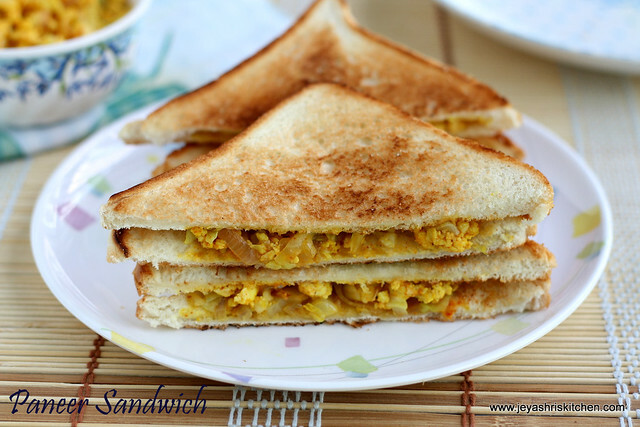 Cabbage and paneer, quite an interesting combo..Irresistible sandwich. My first visit to your space, love this healthy and delicious sandwich! Sandwich looks yummy. Healthy too. 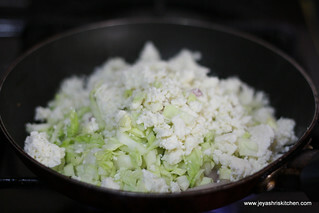 love paneer s/w and adding cabbage to this takes it to a new level. lovely recipe. Paneer and cabbage is a superb combo, I made a side dish with them, yet to post, and the sandwiches look so tempting..
A different combo and looks inviting. Nice combination sandwich...perfect for kids! 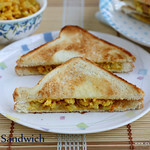 This is very good sandwich also very easy to make..i will try to make it at home.